Great phrasing of this question! It is true that while I am going through the weaning process I am working on more than just the removal of the foal from the mare. I know that this is going to be a big change in the foals life and I try looking at it from the foals point of view. I know my end goal is to have a happy, confident and weaned foal…but the question is how to get there. In the wild, foals are mixed with adults in the herd. I look to set up the change over a period of time and with little steps that stretch the comfort zone. 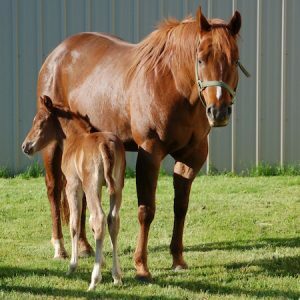 In this prior blog post, Weaning foals with older horses, I showed photos of this years foals being weaned. I mentioned that this was a process. Let me explain more. Ideally my foals have been in some kind of herd environment. That could be multiple mares and foals together, or it could be one mare and foal with a mixed herd of other older horses. This allows the foal to learn to interact with other horses while still under the supervision of the mare. I find that the older the foals get, the more the mare lets them explore the others. This is the natural beginning of weaning. 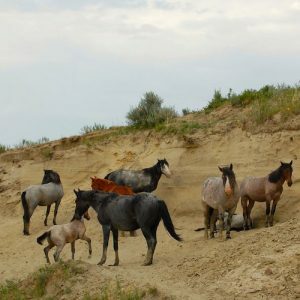 Consider how mixed herds are in the wild. I will also mix the other adults that the foals are around. For example, Popcorn, who was shown in the prior blog, is usually added to the herd. I know that he will eventually be my ‘babysitter’ and the mares already know him. It is natural for me to put him in with the mares and foals prior to weaning. This makes him part of the ‘norm’ when the mares eventually leave. Weaning involves lots of change and so I begin to make change a normal part of life. If I can I change pastures, I change pasture mates, and I change stalls. Any changes I can make, I do. This is done while they are with the mare. One of those changes is separating the mare and foal when they are getting grain. Sometimes my set up allows me to keep them within sight during this, other times I might shut a door to separate them. The key is the the foal has become accustom to changes and is comfortable in the surroundings. Ideally the foal is also more interested in grain which they usually are as they age. Another key to this is that it is short lived. They are separated, they eat, they go back together. They learn that this is a temporary thing. Starting around three months of age this happens twice a day. It is also ideal if the foal can either see the mare or is with the rest of the ‘herd’. Asking the foal to go totally alone is the hardest thing to do so I work my way up to that. 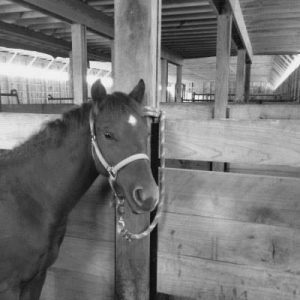 Notice how the foal can see activity in other stalls and the arena. It always amazes me how trainable the foals are and how quickly they learn. I also notice a huge improvement in their confidence as they learn to speak ‘human-horse’ language. Lets face it, we humans don’t act exactly like the mares. Often the foals have been around us but they don’t really know what to ‘do’ with humans. I teach the foals to yield their hind quarters to turn and face me, to back up out of my space and to trot with halter pressure. These basics give the foals an AMAZING amount of confidence. They change how they look at me as soon as I teach them these moves. These are three of the ideas that I keep in mind while weaning. If you have question or comments to add, please feel free to leave them. This is a big topic that has lots of possible combos to discuss. I was just on a ranch that weans around 30 foals a year. Are you curious about what I learned from them? ← No. You shouldn’t get a job doing something you love.